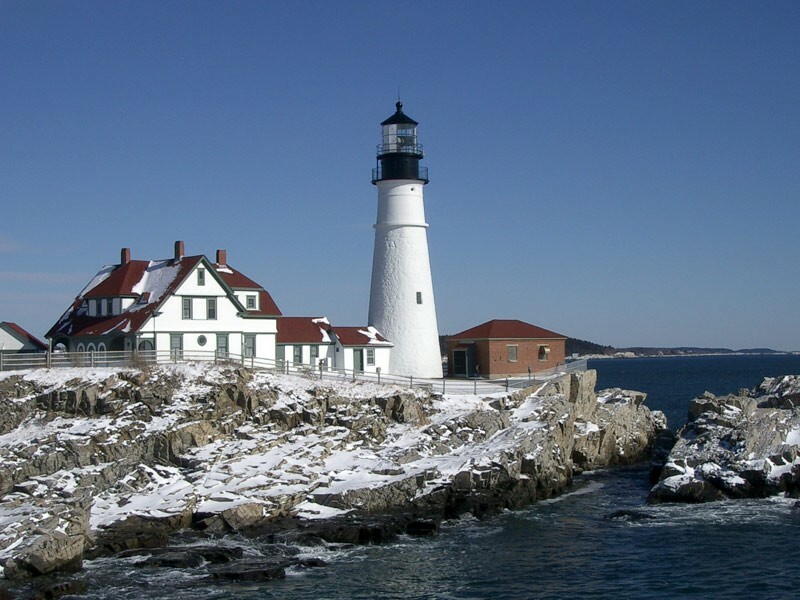 Who Visits Maine Lighthouses in the Winter? Who visits Maine lighthouses in the winter? We do! Before we ever came to Brewster House Bed & Breakfast, we enjoyed visiting and taking photographs of lighthouses – in Maine and elsewhere. After a number of visits to Maine in the Spring, Summer or Fall, we finally made a trip to Maine in the winter. In the back of our minds was the possibility of a light snowfall, and a visit to one of Maine’s beautiful lighthouses to take photos of it. It didn’t quite go according to plan. On the way north to Maine, we drove into a blizzard in Connecticut, Massachusetts and Maine that left the roads icy and visibility very poor. At one point we went into the highway median to avoid another car that had lost control – we were very thankful that we escaped unscathed and made it safely to Maine amid considerable snow, in the dark. The next morning dawned sunny and white, so, undaunted, we headed to Portland Head Lighthouse to see what the snow had left for us. We found a charming winter scene, with a light blanket of snow on the gingerbread keeper’s house, and along the rocks. In the bright sunshine, we were able to take some very nice pictures of a favorite lighthouse, as we had never seen it before! In addition to the unusual beauty of lighthouses in snow, the Cape Neddick lighthouse (the Nubble) is decorated with white lights for the Christmas season. Considering a winter lighthouse excursion? How about some early Christmas shopping at Freeport’s outlets and shops? At Brewster House we’re running two specials – our Christmas Shopper from December 9 through 19, and our Wild Winter Getaway for the month of January 2013 – each provides 3 nights for the price of 2! Get a jump on your Christmas shopping. Check out a lighthouse or three while you’re here! 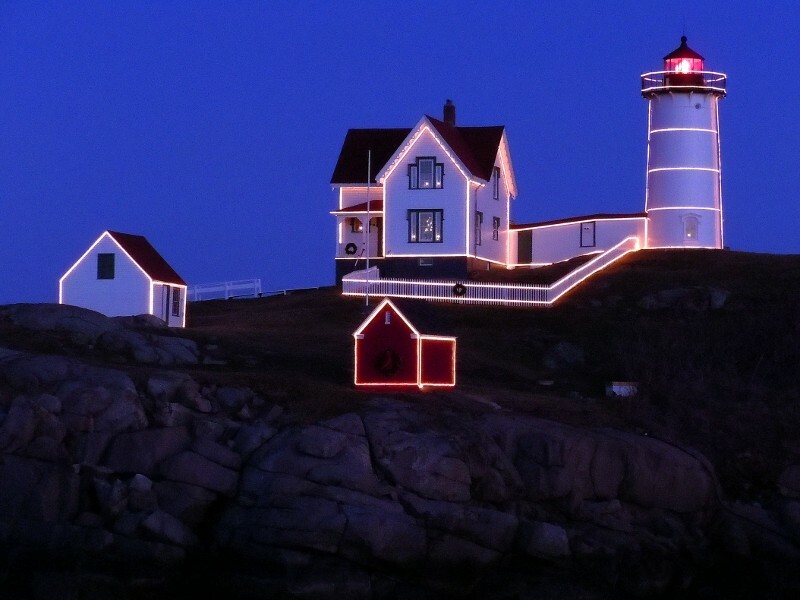 The Best Time… Have The Maine Lighthouse All To Yourself In The Winter.